The mammalian brain is assembled from thousands of neuronal cell types, which are organized in distinct circuits to perform behaviourally relevant computations. For example, local circuits in the amygdala are involved in fear reactions, those of the spinal cord allow us to walk, and in the retina discrete circuits extract different features from the visual world. The biomedical reasons for studying the structure and function of these circuits are that their dysfunction can lead to anxiety disorders, movement disorders or blindness, respectively. In order to treat specific diseases of the nervous system one has to understand the function of the particular circuit involved. 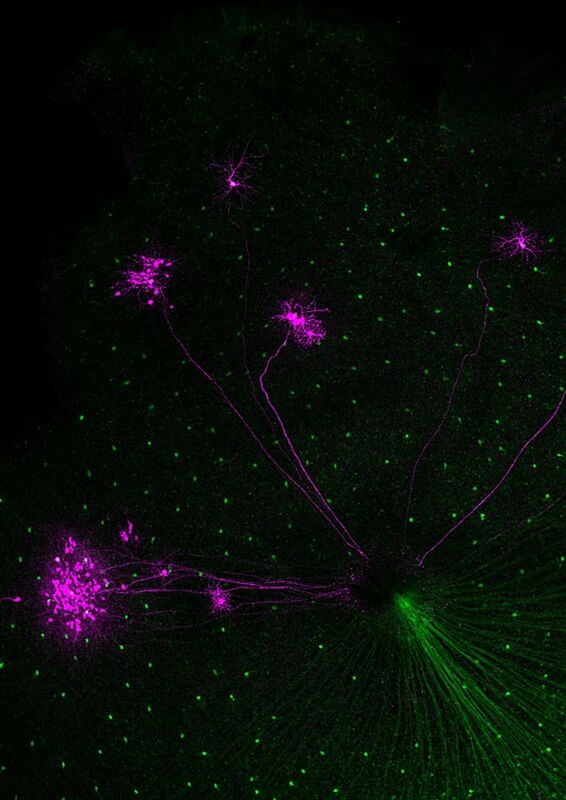 The scientific goal of the Roska lab is to combine different disciplines including mouse genetics, viral tracing molecular biology, electrophysiology and two-photon imaging to understand the structure and function of local circuits at different stages of visual processing. We perform investigations at the front end of visual processing, the mammalian retina. The retina serves as an excellent model system to study the structure and function of neural circuits. First, it is easy to isolate and maintain in vitro. Second, its natural input, the dynamically changing light pattern, can be quantified and presented to the isolated retina. Third, it is feasible to record neural activity from most of its cell types. The retina is a “stand alone” collection of neural circuits since it does not receive input from other brain areas. This fact makes it an attractive model system since any computation observed in the retina can be explained by the circuit components within the retina. 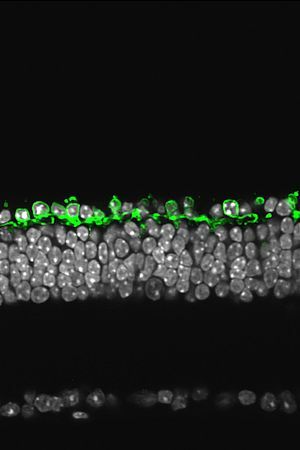 Despite many years of effort, our understanding of the function of retinal circuits is still rudimentary. 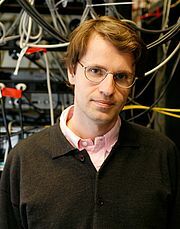 A major challenge to describing the structure and function of different neural circuits is that they are usually intermingled and perform parallel computations. At least a dozen morphologically and functionally distinct ganglion cell types extract different features from the visual world. The ganglion cells are innervated by different types of excitatory bipolar cells and an even more diverse set of inhibitory amacrine cells. While the question “what different ganglion cells are computing?” can be addressed by recording from these cells using electrophysiological or imaging approaches, the “how” question is not as easily approachable, as one should be able to record from many, or all cells of an identified circuit to attack the problem. Our goal is to address the “what” and the “how” question. We “light up” retinal circuits in vivo using various molecular approaches, and then with the benefit of being able to “see the circuits” with two-photon microscopy we record activity during light stimulation using electrophysiological or imaging approaches. Figure 2. Cross section of a degenerated Retinitis pigmentosa retina. The archaebacterial halorhodopsin is produced in the remaining cone photoreceptor cells (green). Only one row of photoreceptor cells is left. In white the nuclear layers of the retina. Our investigations of the retina run on three parallel streams. First, we study retinal computations. We record from genetically identified ganglion cells and vary the light patterns projected on the photoreceptors. At the first stage of investigations we ask what the ganglion cell is computing, namely what are the dynamic light patterns that the ganglion cell does and does not respond to and under what kind of visual behaviour these patterns segregate. At the second stage we ask how the dynamics and connectivity of the cell types within the circuit of the ganglion cell can explain the observed selectivity of the ganglion cell. It is the second stage where advanced methodologies are needed. Second, to gain insights into general principles of neural circuit function and development, we use the retina as a model circuit with genetically identified elements that are easy to manipulate. Questions we are particularly interested about are: network multitasking, plasticity of inhibitory circuit function, development of functional asymmetry and microRNA function in neurons. Third, we use our understanding of retinal processing, the ability to target genetic material to identified cell types and optogenetic tools to create artificial photoreceptors in mouse models of blinding retinal diseases where intrinsic photosensitivity of classical, rod-cone, photoreceptors is lost. The key point is to reactivate retinal function, at least partially, using the artificial photoreceptors. Collaborating with a number of research teams including the team of Jose Sahel, Serge Picaud, Jean Bennett, Connie Cepko, Ernst Bamberg and Patrick Degenaar we try to bring this above mentioned optogenetic vision restoration therapy to patients of retinitis pigmentosa. Optogenetic approaches to restoring visual function in retinitis pigmentosa. Azeredo da Silveira R, Roska B.
Yonehara K, Balint K, Noda M, Nagel G, Bamberg E, Roska B.
Krol J, Busskamp V, Markiewicz I, Stadler MB, Ribi S, Duebel J, Oertner TO, Schübeler D, Schratt G, Fehling HJ, Richter J, Bibel M, Roska B* and Filipowicz W* (2010) . Münch TA, da Silveira RA, Siegert S, Viney TJ, Awatramani GB, Roska B. Approach sensitivity in the retina processed by a multifunctional neural circuit. Nature Neuroscience. 2009 Oct; 12(10):1308-16. Siegert S, Scherf BG, Del Punta K, Didkovsky N, Heintz N, Roska B. Genetic address book for retinal cell types. Nature Neuroscience. 2009 Sep; 12(9):1197-204. Boldogkoi Z, Balint K, Awatramani GB, Balya D, Busskamp V, Viney TJ, Lagali PS, Duebel J, Pásti E, Tombácz D, Tóth JS, Takács IF, Scherf BG, Roska B. Genetically timed, activity-sensor and rainbow transsynaptic viral tools. Nature Methods. 2009 Feb; 6(2):127-30. Nature Neuroscience. 2008 Jun; 11(6):667-75. Viney TJ, Balint K, Hillier D, Siegert S, Boldogkoi Z, Enquist LW, Meister M, Cepko CL, Roska B. Local retinal circuits of melanopsin-containing ganglion cells identified by transsynaptic viral tracing. Current Biology. 2007 Jun 5; 17(11):981-8. Nature Neuroscience. 2003 Jun; 6(6):600-8. Nature. 2001 Mar 29; 410(6828):583-7.